WARM, INVITING, LIVABLE! Impressive keystone brickwork on front elevation * Screen porch overlooking the pond * Elegant Foyer * Entertainment-sized dining room * Open staircase to Finished Basement * Wall of windows in Great Room provides outstanding pond view * Custom milled poplar trim & doors throughout * Level 5 Bristol design Harlan Kitchen in Hickory w/ Cinnamon Stain * Huge Island w/ deep sink & Breakfast Bar * 2 Pantries * (2) 47 Bottle Wine Chillers * Restaurant-style Stainless Steel 5-Burner Range * Standard & Convection Oven plus a Microwave-Convection combination * Stainless Hood and Pot-filler Faucet. Great room has Coffered Ceiling, Built-in Bookshelves, Corner Fireplace--remote-controlled w/ 36 combinations of flame height & fan speeds. Split Bedroom floor plan. Master bedroom has a 6x14 walk-in closet. Master bath has 2 vanities; corner Jacuzzi, vaulted ceiling and a glass & ceramic shower. BRs 2 & 3 have Jack & Jill bath. BR 4 has full bath for use as a guest suite or office. Extra-wide open staircase to basement w/ Craftsman-style Poplar & wrought iron railing, lighted gallery walls; Full wet bar in basement. 11 ft. Harlan Bar for full seating; wide open finished basement space for children’s bad weather “playground” or adult entertaining. 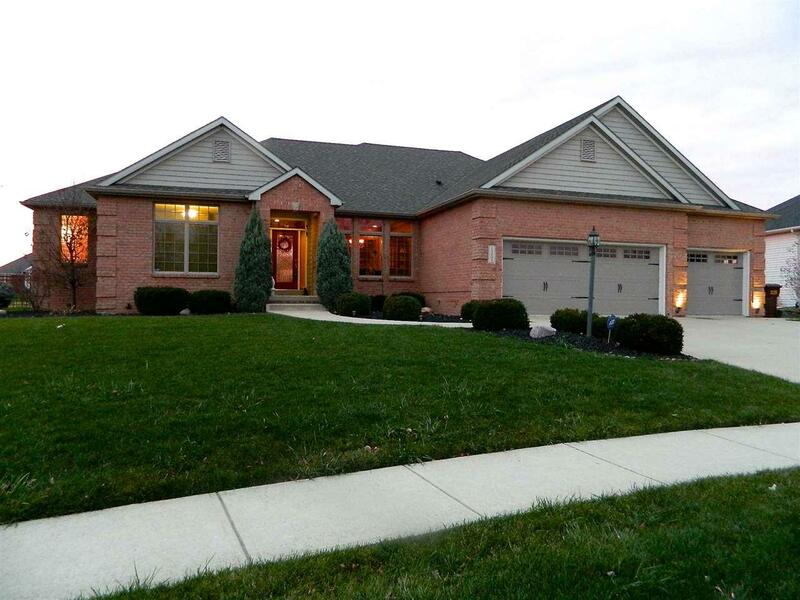 Add to that the Association pool and you have a great value in one of NW Allen County schools premier neighborhoods.